These are London's best afternoon tea venues where the views are as tasty as the sandwiches and scones. Between Westminster Bridge and the London Eye, the Marriott County Hall has a killer location on the south bank of the Thames. Traditional afternoon tea is served in the historic Library Lounge where the windows frame views of Big Ben and the Houses of Parliament. The wood-paneled room features an original fireplace and reference books dating back to the 1920s and once served as a members' library for delegates of the Greater London Council. Tuck into classic finger sandwiches, dainty pastries and sweet and savory scones. The 'free-flowing bubbles' tea is a good value option if you're looking to enjoy a couple of glasses of fizz. After a culture fix at the National Gallery, head three floors up to the restaurant to soak up dramatic views over Trafalgar Square towards the Houses of Parliament and Big Ben. The dining room is decked out like a posh Chinese living room and the kitchen serves two different afternoon teams every day between 12 pm and 4 pm. The Asian-inspired menu brings together dim sum, scones, and pastries and the English option includes sandwiches with a luxury take on traditional fillings including duck egg mayonnaise with truffle and Angus beef with onion jam. For a different kind of view and an alternative to the classic afternoon tea offering, head to God's Own Junkyard, a warehouse stuffed full of vintage neon signs and artwork near Walthamstow Village. Enjoy classic London views while indulging in one of London's favorite pastimes by booking an afternoon tea cruise on the Thames. 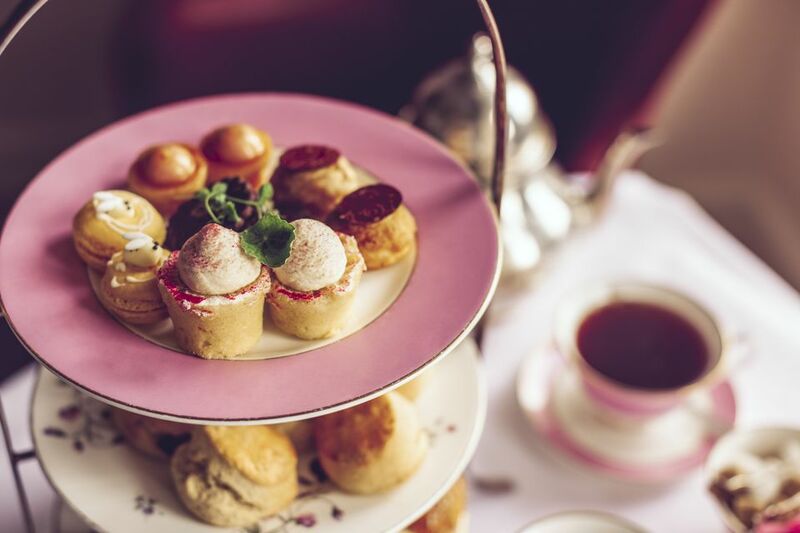 Tuck into sandwiches, cakes, scones served with cream and jam and unlimited tea and coffee onboard City Cruises' 90-minute afternoon tea tour, which departs daily from Tower Pier and sails past the London Eye and the Houses of Parliament. Enjoy music from a live pianist as part of the afternoon tea package onboard Bateaux London; the boat features the largest observation deck on the Thames. The B Bakery boat tour takes place on a vintage motor yacht and the afternoon tea menu includes mini cupcakes, sweet pastries, and macarons. For a quintessentially 'London' experience, take an afternoon tea bus tour of the city onboard a vintage Routemaster bus. The experience from B Bakery combines a 90-minute sightseeing tour through central London and a delicious afternoon tea of dainty sandwiches, French pastries, scones, and tea served in sturdy cups with lids. The seats are configured for parties of two or four; the most expensive seats are at the front of the top deck. The route takes in Knightsbridge, Hyde Park, Trafalgar Square and the Houses of Parliament. For classic riverside views, it's hard to beat the OXO Tower on the south bank of the Thames. The restaurant sits at the top of the OXO Tower Wharf, an iconic building home to creative studios, shops and cafes, and overlooks St Paul's Cathedral, Tate Modern, and the London Eye.